Public figures in Israel, Germany, the United Kingdom and elsewhere have condemned President Donald Trump’s latest remarks on the white supremacist rally in Charlottesville, Virginia, in which he laid blame on “both sides” for the deadly violence that erupted. Such international criticism joined that of many lawmakers and commentators from both sides of the aisle in the United States. A handful of voices from the far right offered veiled or open support for Trump’s remarks — reflecting his enduring appeal to a range of populist and anti-immigrant groups outside the United States. But they were far outweighed by those expressing outrage. German Justice Minister Heiko Maas directly criticized Trump in a statement early Wednesday, saying: ”It is unbearable how Trump now also glosses over the violence during the march of the right-wing protests in Charlottesville. “Nobody should trivialize the anti-Semitism and racism of neo-Nazis. When it comes to right-wing propaganda and violence, there is nothing to relativize. 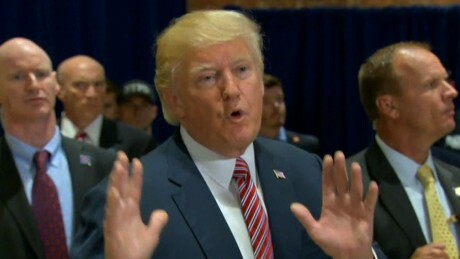 When asked Wednesday about Trump’s comments, UK Prime Minister Theresa May disputed the idea that the two sides in the Charlottesville violence were equally to blame, a Downing Street spokeswoman told CNN. “I see no equivalence between those who propound fascist views and those who oppose them,” May said at a naval ceremony in Portsmouth, England. A number of other British lawmakers were heavily critical of Trump’s comments. Sajid Javid, the secretary of state for communities, posted on Twitter that he’d learned as a child that neo-Nazis were bad and anti-Nazis good. “It was pretty obvious,” he said. Israeli member of the Knesset Tzipi Livni also slammed Trump’s comments equating both sides in the Charlottesville rally. Israeli politician Tamar Zandberg, a Knesset member from the left-wing Meretz party, similarly condemned Trump’s stance. “The doctrine of extremists on both sides is trying to draw an equivalency in a place where it does not exist. Racism and hatred and opposition to racism and hatred are not two sides of the same coin, and the attempt to draw this symmetry gives legitimacy to dark and evil forces that should not have a place in the public discussion,” Zandberg told CNN. Netanyahu was silent about the Charlottesville rally at his weekly statement at the Sunday cabinet meeting. Instead, Netanyahu said Israel would welcome Trump’s representatives to the region before switching to talking about domestic security. Even Iran weighed in Wednesday on the controversy over Trump’s remarks. Supreme Leader Ayatollah Ali Hosseini Khamenei — himself an on-the-record Holocaust denier — issued a statement on his official website in reference to Charlottesville in which he said the US should fix its racial-discrimination issues and mind its own business on the international stage. “If you are a powerful state, then go manage your own country! If you really care, then tackle the insecurities and violence on the streets of Washington DC, New York City, and Los Angeles! If you really care, go fix racial discrimination and the disastrous violations of human rights for both whites and blacks in your own country! Mind your own business, rather than meddling with other nations’ affairs!” he said. Far-right groups around Europe have remained largely silent over the events in Charlottesville and ensuing backlash against Trump’s comments.